This dress was a long time coming. 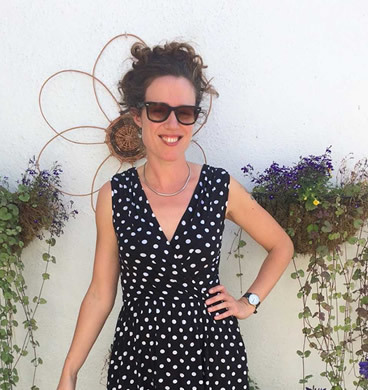 I’ve been planning a plain black Tilly and the Buttons Cleo dress for almost two years now, after having made three other much loved versions (links to all of which are in this blog post) in colours and patterns. Now, sewing black clothing with black thread isn’t exactly an exciting prospect (eye-strain ahoy! ), but I’m pleased to report the contrast topstitching meant this make was great fun to sew and more importantly, I absolutely adore wearing it! The Cleo Dungaree Dress probably needs no introduction as it’s been a hugely popular pattern, so I’ll just say I made the longer version, with front and back pockets, dungaree buckles and left out the optional split. I had to leave out the split as I cut the front and back on the fold rather than as two pieces, but fortunately it isn’t needed to walk comfortably. I wanted a workhorse fabric that could be chucked in the tumble drier and withstand having baby sick vigorously scrubbed off it on an hourly basis (I kid you not, some days are like that round here! ), so I opted for Minerva’s medium weight Cotton Drill Fabric. This is a lovely quality, hardwearing twill fabric which comes in a range of thirteen colours—I predict the navy and purple will be appearing in my wardrobe in the future as this fabric was an absolute dream to sew. My past Cleo dresses have been graded from a size 3 at the waist to a size 4 at the hip, but I can’t currently get them on (need to find time to work out again!) so I knew I’d have to size up with this one. As I already had the pattern traced out I approximated the next size up by simply shifting the pattern piece over by 15mm when cutting the side seams, figuring it will then be easy enough to take it in when I eventually lose the baby pounds. I’ve made this dress so many times I don’t really need to do more than occasionally glance at the instructions. It’s written for beginners so is really easy to follow, with clear colour photographs to illustrate every step, along with handy tips. One thing they left out that I always do, however, is staystitching the curved edges. I didn’t do it the first time and had a bit of a mare easing in the facing. Make sure you staystitch, people! I realised once getting the fabric ready for cutting that I didn’t have enough medium weight iron on interfacing in my stash. After a moment of cursing myself for not having ordered any (baby brain strikes again!) I remembered I did have some medium weight sew in interfacing, the same as this one available from Minerva. Okay, it was white but you don’t ever see it inside the dress and the fabric was thick enough for it not to show through, so I didn’t think it would matter. I’m actually really pleased with the feel of this interfacing in the finished garment and will definitely use it again for this weight of fabric. The only real difficulty I had with this make was getting my topstitching perfect. Let’s face it, I’ve gone for about as much contrast as it’s possible to get here, so any wibbles would be horrifyingly obvious. I only dared go for what is effectively white on black (the topstitching thread colour is called sandstone, but it reads as white against the black) because I’ve practised topstitching on my other Cleo dresses and got pretty damn good at it. Even if I do say so myself! For the first time I tried using proper Topstitching Needles and I’ll definitely be using these in the future. No skipped stitches this time around! The pack comes with three different sizes and through trial and error I discovered that the 80 size needle shredded the thread, and the 100 left visible holes in the fabric, so 90 it was. I also trialled a different Topstitching Thread, as I’ve heard good things about Mettler thread. Turns out it’s a bit less shiny and more fuzzy than Gutermann, so I’ll probably be sticking with Gutermann in the future as I prefer the way it looks. I didn’t notice any difference in ease of use, however, so I’m guessing they’re of a similar quality. Ditto for the Regular Sewing Thread I used for sewing it together—also a Mettler thread. One silly mistake I made with this dress—and I’m blaming the baby brain again—was forgetting to widen the straps for the Silver Buckles I’d ordered. I knew when ordering them they would be a little wide for the straps as drafted, but figured it would be an easy alteration to make and give a slightly different look for this Cleo. Variety is the spice of life, after all, and part of the fun of making the same pattern over and over is changing little details. But I forgot, so at the moment the buckles look a wee bit oversized. I’m going to have to replace them with a set that fit the straps better. But hey, that means I have a spare pair of buckles just begging for another Cleo dress (or perhaps some Jenny Overalls?) to be made. That can’t be a bad thing now, can it?! NB, these buckles don’t come with buttons, but the Prym Jeans Buttons are the perfect match. And as there are eight in a pack I have enough left over to make side openings for my next Cleo dress. Something that will definitely help make it easier to get on over my hips! As for the finished article? Well, oversized buckles aside I’m absolutely thrilled with my new Cleo dress. It’s absolutely perfect for breastfeeding access and made in a really practical fabric that goes with all my tops. But most importantly, it’s super comfortable and I feel like myself again. Pregnancy, my post-birth body, and the constraints of feeding a baby have meant I haven’t been able to wear most of my favourite me-mades for the past year, and this dress feels like a return to my true style. Woohoo! Now I just need to make some more fabulous tees to go underneath it. Any excuse!